If you are thinking about staining your garage floor, then pay close attention. It’s a DIY project that has slowly become more popular than ever before. The first decision that has to be made, however, is what type of stain or dye is best for a garage floor? Well, Legacy Industrial has made that decision much easier with the arrival of their new DeltaDye water-based penetrating concrete stain. 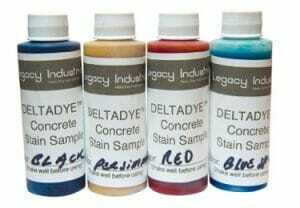 Legacy Industrial contacted us and sent over a sample kit of their new DeltaDye concrete stain to review for ourselves. 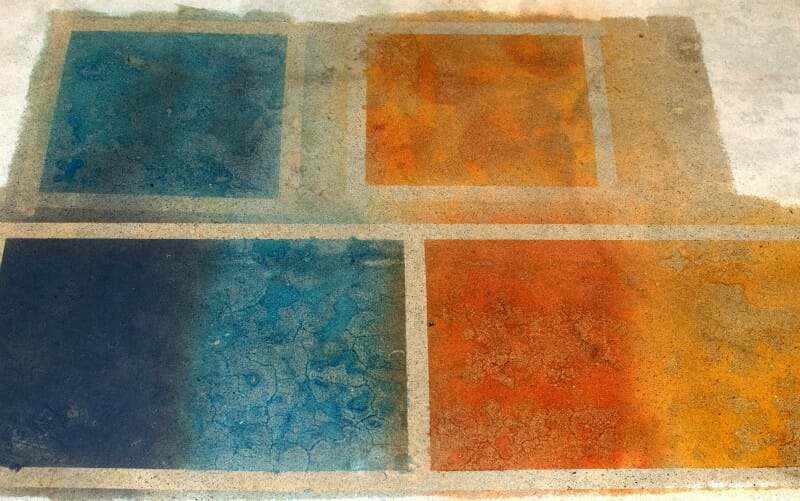 Before we discuss our impressive results and the benefits of DeltaDye as a garage floor stain, it’s first important to learn a little bit about concrete staining in general. Fully cured bare concrete is treated with a liquid stain or dye to change the color at the surface. It is usually applied to the concrete with a pump up sprayer, a paint brush, or paint roller depending on the type of stain. Once the staining process is complete, a clear topical coating is applied to the concrete. The clear top coat is what seals and protects the stain (as well as the concrete), making the otherwise dull looking colors “pop” with vibrancy. There are multiple types of stains and dyes available. 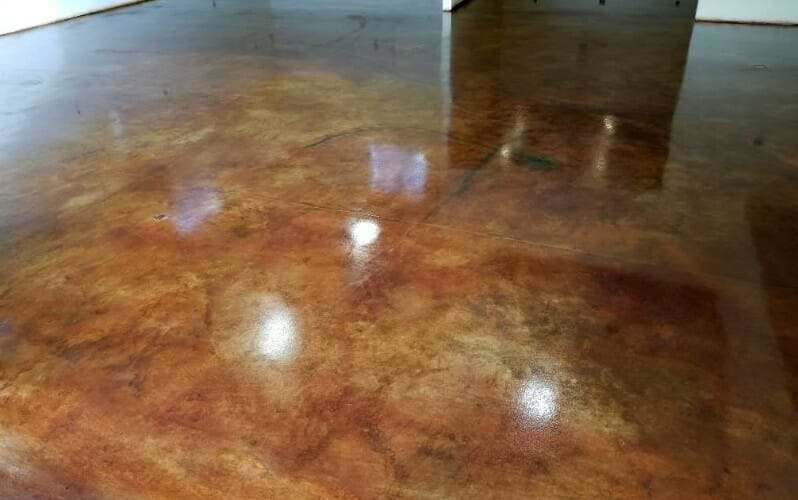 While the number of stains available can seem daunting at first, a few of these are specialty stains that are used more for decorative concrete design in the home and business and are not necessarily suitable for a garage environment or outdoors. The most popular of these that people are familiar with for a garage floor are acid stains. Acid stains are reactive. 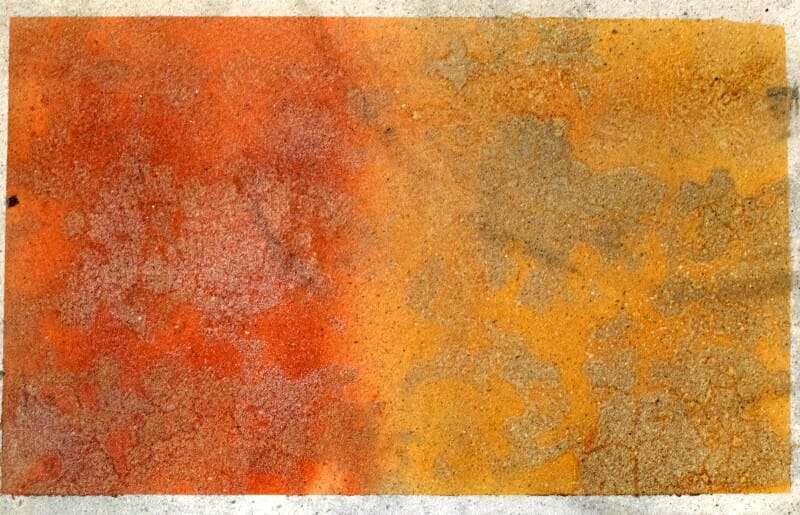 Once applied, they react with free lime on the concrete surface to produce beautiful and translucent earthy colors with nice patinas, veining, variegation, and mottling that they are most known for. It’s a popular look that people want in their garage. OK, we see the question coming. Why would you want to use a water-based concrete stain such as DeltaDye over an acid stain for a garage floor then? The reason has to do with the characteristics and requirements of acid staining. If you are not familiar with the acid staining process, some of these characteristics can cause poor results. They can also shy the inexperienced away as a DIY project once they learn the steps required. The first characteristic is that you are dealing with acid. Safety precautions need to be taken before you begin the application process. It’s easy to get caught up in trying to achieve the look you want and forget that you are working with a dangerous chemical. A lessor known but far more important characteristic is that the amount of lime at the concrete surface will affect the stain. If the concrete is fairly old, or has been previously acid etched, or had to be treated with grinding in order to remove contamination such as glue, oils, concrete defects, and etc., there is a good chance that there will not be sufficient enough lime available at the surface for the acid to react with. The result can be a poor stain outcome that looks faded and may even wash out. Furthermore, because acid stains are reactive, you have less control over the final look. The stain can be darker or lighter than what you may have anticipated. You are also limited with color selection. 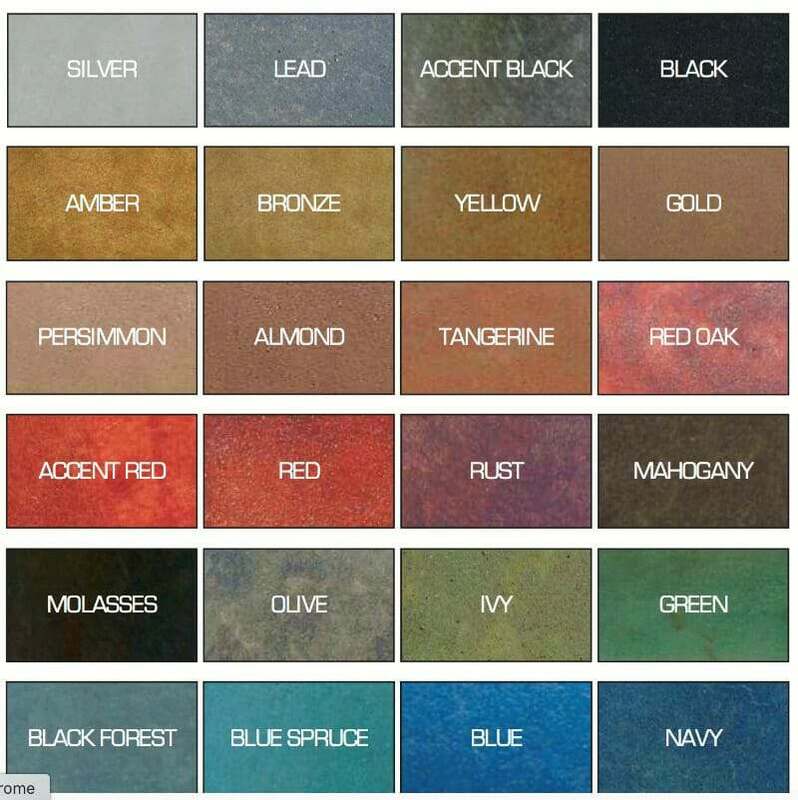 The organic nature of acid stain can only provide natural earth tones for color. Finally, acid staining is more labor intensive and takes much longer to complete. The acid typically needs to remain on the concrete for a minimum of five hours or more in order for it to fully react properly. The surface then has to be neutralized to return the concrete back from an acid state to a basic state. It is then washed by scrubbing down in order to remove all unreacted stain and stain residue. It’s not uncommon to go through more than one scrubbing. If this step is not done properly, the remaining residue will cause problems with your protective clear coat. Now that you know some of the characteristics of an acid stain, let’s look at why a water-based penetrating stain can have many advantages over an acid stain. Some water-based penetrating concrete stains can have distinct advantages over acid staining and DeltaDye in no exception. DeltaDye is available in 24 different colors and works by penetrating the pores of the concrete and creating a permanent stain that is vibrant in color with a variegated and translucent look. Just like acid stain, DeltaDye is U.V resistant and will not fade. This makes it an excellent choice for garage floors exposed to sunlight as well as for patios and walkways. Some water-based penetrating stains, as well as chemical stains and dyes, are less U.V. resistant and can fade over time if exposed to sunlight. Water-based stains are also eco-friendly. They will not harm your skin, there are no toxic fumes or VOC’s to worry about, and they are safe for vegetation. Water-based stains typically have a larger coverage rate than acid stains as well. Additionally, unlike acid stain which is reactive and has a somewhat undetermined outcome, you can control the coloring and design with a water-based stain. This is done by regulating the amount of stain you apply, the application method, as well as the ability to accent with other colors. 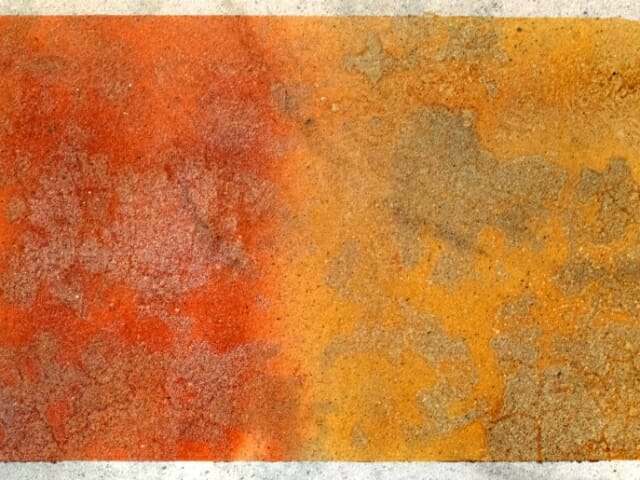 Water-based concrete stains do not require neutralizing or scrubbing either. Once the stain has dried on the surface, it is ready for a clear coat application. This particular feature takes a lot of the labor out of the process and is a huge time saver. It can reduce the entire application process down to a single day depending on the clear coat you have chosen. Concrete surface preparation for a stain is the same regardless of product. The concrete needs to be clean. The surface has to be free of any paint, coatings, sealers, oils, waxes, dirt, or any other substance that would prevent the stain from penetrating the concrete. Any repairs that need to be made to the garage floor should be done at this time. Repairs that you make to the concrete should be done with a cementitious based product. If you use a resin-based product such as epoxy or polyurea, the stain will not take. If the surface repels water, then light sanding, etching, or grinding will need to be performed before DeltaDye can be applied. If water will not penetrate, neither will the stain. Our recommendation is to use a pump up garden sprayer with a circular spray pattern. This type of application can provide a more variegated look. However, you can also apply DeltaDye with a paint brush or roller. If using a single color, the first thing you want to do is apply a single coat to the entire surface. Mottling will be achieved through the varying degrees of porosity in your concrete. You can darken the color or achieve “acid effects” by applying additional stain in random and irregular patterns. If using more than one color, it is recommended to apply lighter colors first as a base color and then accent with the darker colors. You can also add water to colors to make them lighter. The stain generally needs 30 minutes to 1 hour to dry. Once dry, you can apply additional coats and/or accents and colors. It really is up to your imagination how you want it to look. Once you stain your garage floor you will need to seal and protect it with a film forming clear coat. Not only does this protect the stain, it wets it out to make the color pop and look vibrant. Most stains will look dull and sometimes even ugly until you get the clear coat applied. For a garage floor, Legacy Industrial recommends their HD6525 MMA acrylic sealer, SEC Sealer (epoxy), or Nohr-S polyurea sealer. If you don’t have a busy garage and want the easiest sealer to apply, then the HD6525 would be a good choice. We did an article on HD6525 here a while back. This type of sealer does not require any other additional concrete prep other than what is required for DeltaDye. Once the stain dries, you can immediately begin applying the sealer. For garage floors that will see medium to heavy duty use such as car maintenance and repair, home improvement projects, workshops and etc., the epoxy SEC Sealer or Nohr-S would be a better choice. You can read about Nohr-S here. These types of coatings are extremely durable and will last for years. If choosing a sealer other than HD6525, you will first need to acid etch or grind your concrete before applying DeltaDye. The reason is that the higher performance coating such as epoxy and polyurea require a more porous concrete surface in order to achieve a good mechanical bond. Unlike acid stains, this type of concrete preparation will not affect water-based stains such as DeltaDye. It may reduce the coverage rate of the stain, however, since there will be better penetration of the concrete surface. Legacy Industrial sent us a sample kit of DeltaDye that comes with four 4oz. pump sprayer bottles. The colors we received were Lead, Gold, Red, and Blue. They also sent us HD6525 sealer as well. We were excited to give DeltaDye a try and applied the samples to a small section of a garage floor to see how they would look. The concrete we applied the stain to was older and had some surface imperfections and fine spider cracks. This type of surface only adds to the character of the stain and helps to create an effect that some people find desirable. Your results will vary depending on the condition of your concrete. Because penetrating water-based stains and acid stains are translucent, concrete imperfections and repairs will show through and add to the character of the floor. As and example, we purposely left a circular stain on the concrete that was made from a tire and wheel laying on the surface. You can see how it shows through in some of the images. This is why it’s important to get the concrete as clean as you can. We also want to point out that the concrete had been treated to grinding a year previous. As you can see in the following images, the grinding of the concrete did not affect how well the concrete took the stain. As we stated, this is one of the advantages to using a penetrating water-based concrete stain. Acid stain would not have worked well with this floor. Lead and Blue were applied next to each other in one section and then Red and Gold were applied next to each other in another section. We did this in order to show some of the color contrasts. You also get an idea of what stain looks like before it is sealed. The small pump bottles create a fine spray and we felt that it wasn’t going on as heavy as it should, but we liked the results nonetheless. It just requires more pumping. In hind sight, we should have unscrewed the tops to sprinkle heavier applications on for some accenting. The first thing we noticed right away is that the lighter colored stains quickly took on a variegated look as it was absorbed differently by the concrete. The color also darkened in the fine spider cracks. The Blue stain in particular was stunning in this regard. What was interesting is the color Lead. Because it was much darker, it did not show as much variegation as the lighter colored stains. Two applications of each color were applied and we only had to wait about 25 minutes between coats. We then did two separate sections of Blue and Gold. After these had dried, we sprayed a small amount of Lead stain over the Blue in a couple areas and we did the same with the Red stain over the Gold. This helped to create a mottled look of different hues. We can see how you can get real creative this way with just two colors and your imagination. DeltaDye with 2 thin coats of HD6525. The top Blue sample has Lead added and the top Gold sample has Red added. After our samples had dried completely we treated them with two thin coats of the HD6525 sealer. The sealer rolled on easily and provided a glossy look that made the color really stand out. Taking a good picture proved challenging for us and the one we posted here doesn’t do the stain justice. The gloss of the sealer created an overpowering shine due to the overhead lights. We couldn’t take the picture in the dark or with a flash, so we finally had to edit it and take some of the gloss out. It would have been much easier if we were photographing an entire floor and not one small area. We found that DeltaDye water-based penetrating concrete stain truly provides a stunning look and is very easy to apply. We really liked how the color varied as it was absorbed by the concrete. Admittedly, the older concrete with the fine spider cracks really made this stain pop with character. If you are applying it to fairly new concrete then you will not get quite the same look that the fine spider cracks provided. If you are going to seal the stain with HD6525, then the entire process couldn’t get much easier. The hardest part of the job may be clearing out your garage floor and cleaning the concrete. This combination of stain and sealer can make for some fairly easy DIY decorative concrete projects in and around the home for the garage floor, walkways, patios, and pool decks. 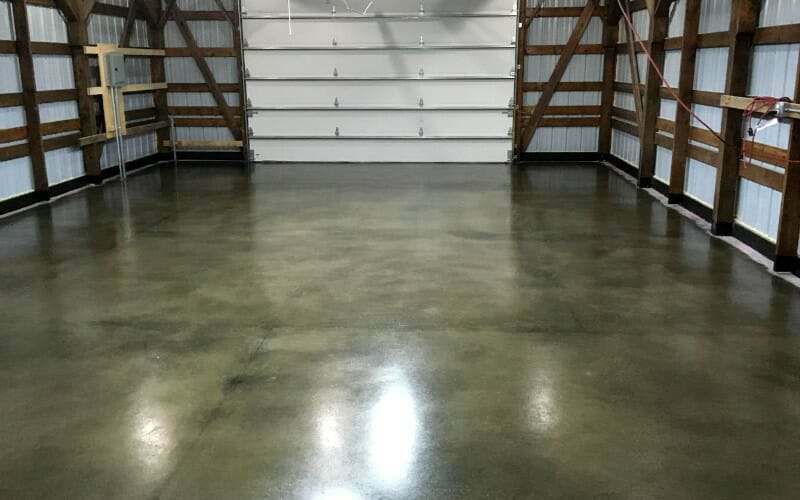 If you are someone who is inclined towards automotive repairs and maintenance or other projects in your garage, then we would recommend that you use an epoxy or polyurea clear coat sealer instead. Remember that this will require that you properly prep the concrete for these types of sealers before you begin the staining process. 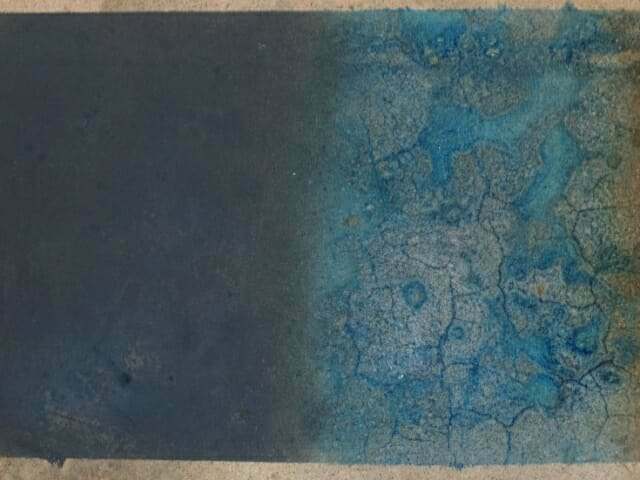 Do we think that DeltaDye water-based concrete stain provides the same results as acid stain? No, not quite, but we feel that it’s close enough for most people who don’t want to deal with the acid staining process. Though the colors of DeltaDye are definitely vibrant, acid staining can sometimes provide some stunning effects due to the lime reacting process that is hard to replicate with other stain types. Keep in mind, however, that DeltaDye provides a better color selection than acid stain and a more controlled outcome for the look you want to achieve. In short, we highly recommend DeltaDye if you want an easy to use DIY concrete stain that will provide excellent results. It’s Eco-friendly, U.V. resistant, and provides a vibrant, translucent look that is similar to acid stain. You can contact Legacy Industrial directly for pricing and further questions. I’ve done some acid staining with concrete in the past and am looking to try some regular concrete stain. What is the cost of it per gallon and the coverage per gallon assuming 2 coats? Does it pentrate the concrete as deep as acid stains. And does it hold it’s color as well? Hello Mike. Acid stain actually reacts with the free lime in concrete which in turn produces the deeper looking colors and marbling effect. It doesn’t necessarily penetrate deeper unless applied to very dense concrete to begin with. 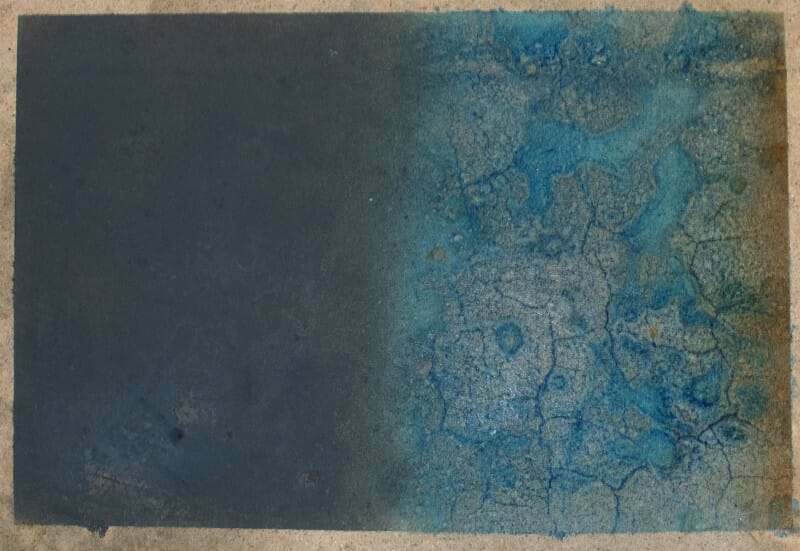 Penetration of water-based dyes, such as DeltaDye, depend on the initial porosity of the concrete. Sometimes they may require some agitating or heavier concentration to penetrate. Like acid stains, they hold their color very well and they have a much better color selection. The type of clear sealer you choose can effect how well the concrete accepts the dye as well. For example, if you plan on applying an acrylic sealer, profiling the concrete (grinding or etching) is not required in most cases. As a result, it may require a heavier application of the dye in order to achieve the look you want. You also will use less dye. Again, it depends on the initial porosity of the concrete. On the other hand, if you plan on a clear coating that requires profiling of the concrete first (epoxy, polyurea, etc), then the concrete will readily absorb the dye at a greater rate. The coverage rate of DeltaDye is 200-300 square feet per gallon. The rate is dependent on the porosity of the concrete and number of coats required to achieve the look you are after. We recommend contacting Legacy Industrial directly if you would like more information or guidance about the product. Can the water based stain be used indoors? I’d like to put a stain on my craft room floor (house is only 6 yrs old) but am intimidated by the acid process. Hi Jenny. Yes, it can definitely be used indoors. Water-based stains are commonly used for that purpose. Hello, I just finished my cement kitchen counter, 1/2” thick with 2”x1” overhang edges, poured over 3/4” plywood. 64 Farenheit and 20% humidifty inside the house. How long before I may apply Deltadye on it? Hello Ekoh. Most cement countertops require that you wait a minimum of 4-5 days after the pour before you stain. You may have to wait up to 10 days or so before sealing with a coating such as epoxy or an equivalent. Hello Lonnie. Yes, it will work fine for that. do I understand it correctly that this product works on outside concrete, not just inside garage floors? You are correct, Lonnie. It can be used both indoors and outdoors. Just remember that all stains need a clear coating to make the colors pop and stand out. Otherwise, they will look dull and drab. Hi Shea, did you stain the green/black concrete shown in the 3rd photo from the top? It says “Mahogany” and “Black accents” were used – I’m not sure if “Black accents” refers to the color or something else. If they were mixed together, how do you go about this? I’m working on a restaurant project now and this would be a perfect look for it. Thanks! Hi Nicole. The base color is Mahogany stain and the black accents are black stain that is applied to various areas on top of the Mahogany. Generally, the lighter color stains are applied first and the darker stains are applied afterwards to accent the lighter colors. Keep in mind that no two concrete slabs are alike. Each is different in terms of porosity, density, surface texture, and concrete mixture. As a result, you can apply the exact same colors in the same way to two different slabs and each will look slightly different.